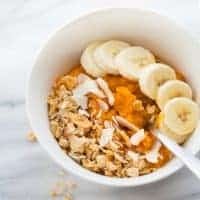 Instant Pot Sweet Potato Breakfast Bowls! 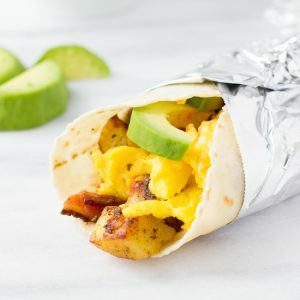 An easy, healthy and filling breakfast! 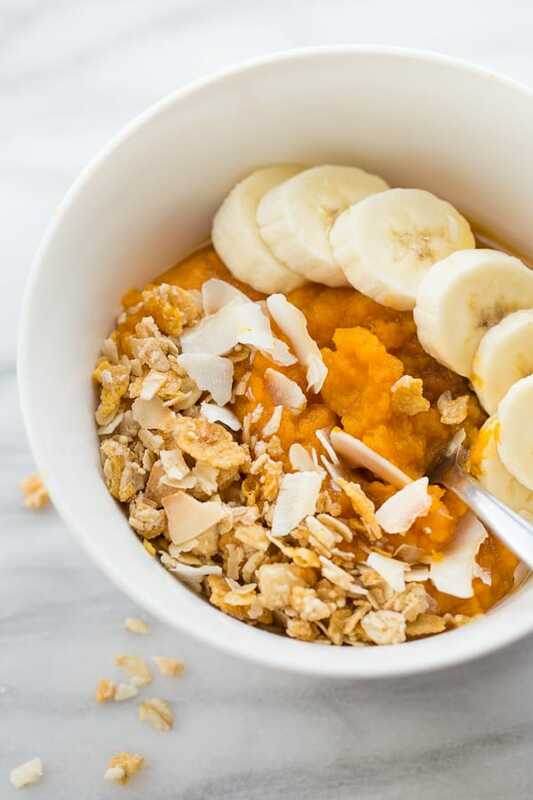 These Instant Pot Sweet Potato Breakfast Bowls are sure to be your new favorite healthy, allergen-friendly breakfast! It’s no secret I love my instant pot and cooking sweet potatoes in it has been a game-changer. 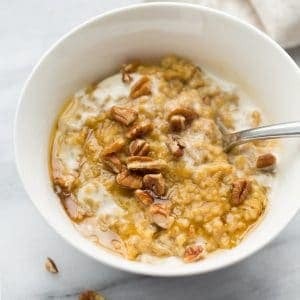 This is a super simple, but warming and delicious fall breakfast. You cook the sweet potatoes in the instant pot then mash them up with Good Karma Foods Flaxmilk a splash of maple syrup and a sprinkle of cinnamon. I also like to add a bunch of different toppings like bananas, granola and coconut flakes. 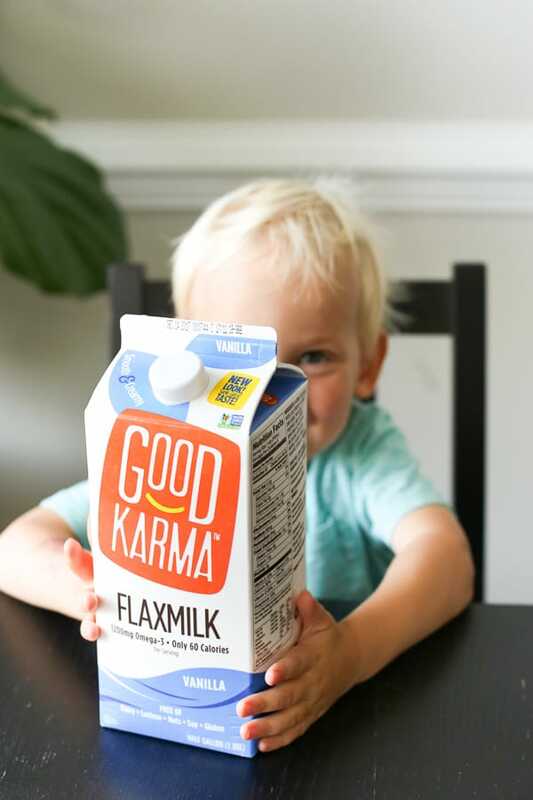 Good Karma Foods Flaxmilk is such a great option for dairy-free, nut-free families. 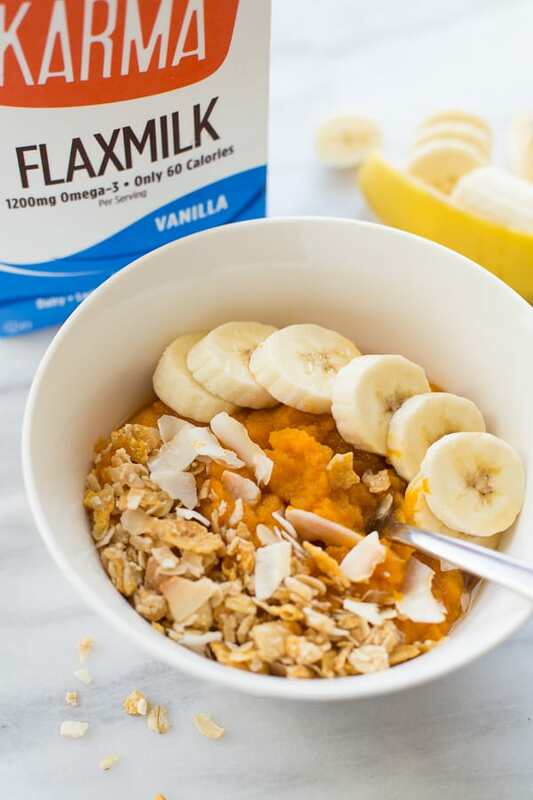 Not only is it free of all major 8 allergens, but Flaxmilk also contains plant-based protein and omega-3s. I love it’s creamy texture and light flavor! It is really versatile and great on its own or used in recipes. 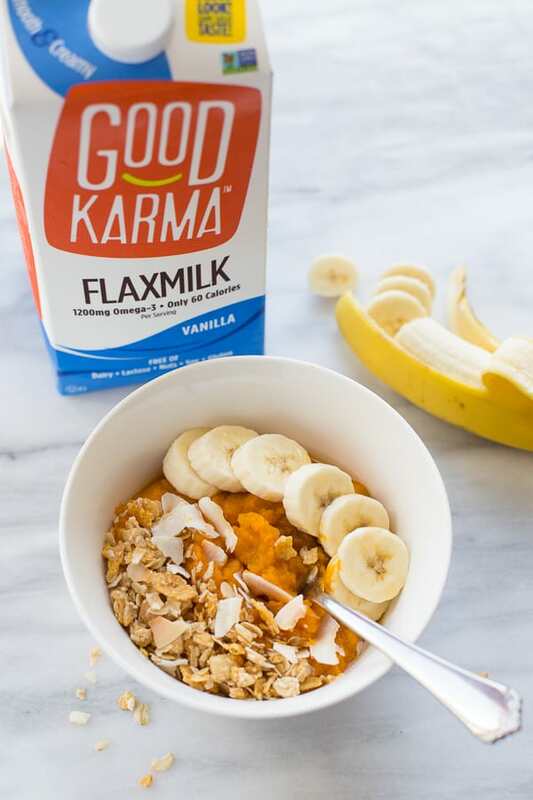 I’ve partnered with Good Karma Foods for their Pour on the Goodness Campaign. Sharing goodness and kindness has been heavy on my mind this fall following the natural disasters and acts of violence our country has recently faced. Sometimes with everything going on in the world it can be easy to get overwhelmed and wonder how we can really make a difference. I think often times the most powerful way we can spread goodness is by starting with the people right around us. I love the quote from Mother Teresa “If you want to make a difference in the world – go home and love your family.” We have the power to spread kindness through small acts in our own spheres of influence. Fall isn’t just about back-to-school, it’s about falling back into our family routines and connecting with our communities. As a family, one of our goals this school year has been to stop and help when we see someone in need. It is amazing how the opportunities for good seem to appear everywhere when you’re paying attention! Before school my family tries to eat breakfast together as often as possible. It is a great time to connect and talk about our plans and goals for the day. It is also a great time to reflect and talk about ways we’re we able to help others that week. These acts are usually small, like helping an elderly neighbor pull in her trash can from the curb, talking to a kid who seems left out at recess, or letting a Mom with a crying child ahead of us in line at the grocery store – but sometimes the small things can make all the difference is someone’s day! Good Karma products are available nationwide in natural foods stores, mainstream supermarkets and superstores. Visit the Store Finder on the Good Karma Foods’ website to find a location near you. I have purchased mine locally at Target, Sprouts and Whole Foods. 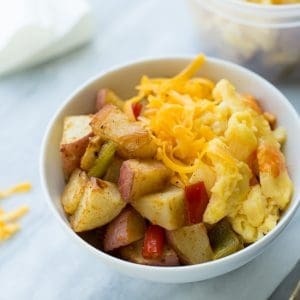 These breakfast bowls are the perfect way to start the day! Thoroughly wash the sweet potatoes. Place the wire rack insert in the instant pot. Add the sweet potatoes on top of the rack and pour on the water. Close the instant pot lid. Press MANUAL and set timer for 16 minutes. Let sit 5 minutes then quick release. Remove the sweet potatoes with tongs. Scoop the sweet potato out of the skin. Add the Good Karma Flaxmilk, salt, cinnamon and maple syrup. Mash into desired consistency. Top with toppings of choice. Enjoy! The cook time will depend greatly on the size of your sweet potatoes. If using sweet potatoes with a larger circumference (larger than 6 inches) increase the cook time to 22 minutes. If the sweet potato isn't cooked all the way through following cooking you can microwave it for a few minutes until totally tender. Wow!! What a great warm comfort food for the cool weather! I didn’t have Flaxmilk, so I used unsweetened vanilla almond milk…delicious! (I will be stopping for Flaxmilk for the next batch.) Then I tried adding vanilla protein powder (one scoop per whole potato), and that turned out great, too. Thank you…this will be a staple in my weekly food prep!! What great ideas! Thanks for the comment. Glad you like it! This looks so delicious! I’m trying to find a bunch of vegetarian instant pot recipes to start with and you have a ton of great ones!